This interactive desk and chair station combines fun and safety for kids of varying age and size! 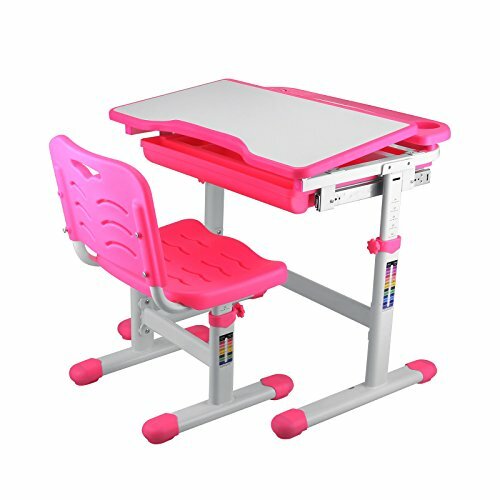 Perfect for kids' rooms, study areas, and more, this features an adjustable tilting surface (from 0 to 40 degrees) made of sturdy PP grade plastic, and an organized pull out drawer for storing papers, coloring books, coloring utensils, etc. Both chair and desk have a sturdy steel frame and are both height adjustable to keep up with your fast growing child. 4.Large organized pull out drawer for storing coloring utensils, books, papers, etc.